Games often try to do everything. Some have multiple engines to handle their different systems; platformers have driving bits, and RPGs have action minigames. This is despite the fact that the best known designers — Wright, Crawford, Meiers – say it’s better to make a deep game by the simple interaction of a few parts than to try to do everything. The adage is it’s better to do a few things well than a lot of things poorly. Jaffe’s design plan can work. God of War somewhat followed this concept, and I think Shenmue did to a degree as well. 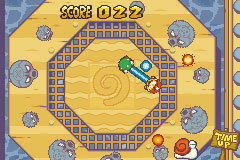 Then there are games of only minigames like Wario Ware, which is not just very successful but is very good. If these games can integrate so many one offs into their design and still excel, why are there still so many good games that feel like they have extra engines tacked on? And why do some games, like Super Star Saga, manage to pull off many minigames and still work despite not venturing anywhere near Jaffe’s design concept of all one offs? The most obvious answer is quality. Super Star Saga’s mingames follow the lead of its main gameplay, they are fun and original. They range from traditional — traversing caverns in a speeding cart, a modified game of Tetris — to traditional but odd — jump roping — to just odd — tie dying shirts for an animate bean, and doing a speed run through the ocean while surfing on Luigi. There are games beside Super Star Saga with tacked on features and minigames that are fun independently of the rest of the game, though, so quality alone cannot be the full answer. Hammers play an integral role inside and outside of battle. Integration is as important as quality. Some games have you battling demons then snow boarding, alternating. This may somehow be plausible, but most likely, even if the snowboarding bits are fun, will come off as a tacked on feature that can be put on the back of the box and in press releases. The difference, or lack of a difference, between a game’s main gameplay and minigames is crucial to integration. Super Star Saga is something of an original (reminiscent of Paper Mario) hybrid between a platformer and RPG, allowing you to mash buttons mid turn based battle to inflict more damage or dodge incoming attacks. Button mashing is also used to perform some significant platforming (in fact, there are a few left to right scrolling areas that play out like Super Mario Brothers 1) and puzzle solving outside battle. 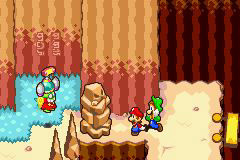 The puzzles generally have you make use of abilities your characters have in new patterns: Mario can use a hammer to smash Luigi into the ground, or Luigi can use a hammer to shrink Mario, if hit with a hammer on special tiles, Luigi becomes a surfboard, if Mario drinks some water and then Luigi hits him with a hammer, Mario spits the water across the board, and so on. Thus, most of the minigames make use of actions that you have already been performing throughout the game. Fawful scares the bejesus out of the brothers. The minigames in Super Star Saga that shouldn’t fit well with the story never come off as just stuck in willy nilly because the game embraces an absurd and hilarious randomness; almost anything fits well. While the minigames are very well integrated into Super Star Saga as a whole, they also make up a small percentage of gameplay time. 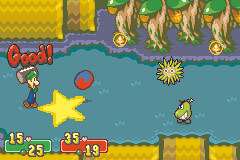 A majority of the game is spent doing the aforementioned platforming, puzzle solving and battling. This is important because the unnamed games I have been complaining about often attempt to elevate the non-essential game engines to something like a quarter of playtime, which is far too long to play a game that is barely related to the main game and that uses few of the same play mechanics. It seems the best design choice is to follow the greats — you will not see a separate battle engine and game in Civilization 5 — and focus primarily on your main mechanics, or go Jaffe’s and Suzuki’s route of making nearly everything a one time affair. If a game must have more stuff to do, say because the PR people demand another bullet point on the back of the case, follow AlphaDream’s lead. Make the parts that are separate from the main game as much fun as the main game, integrate them both in the plot and the gameplay mechanics, and do not allow them to feel like a chore by making them too frequent. I also agree on your take that mini-games should be integral to the main game. Think Resident Evil 4 and the aforementioned Shenmue (which was awesome, by the way). I can’t stand it when games just break from the established gameplay to load up a mini-game that has nothing to do with anything. It’s just as you say, another bullet point for the case. And think, all that time wasted on making those crappy-to-begin-with mini-games could have gone to make the main game better. It’s basically bad designing and management. And if Jaffe ever made a game where I would have to learn the game over and over again, then count me out. im a good part of the way through this game right now, and i think the mini games and constant switching of mechanics is a real asset. 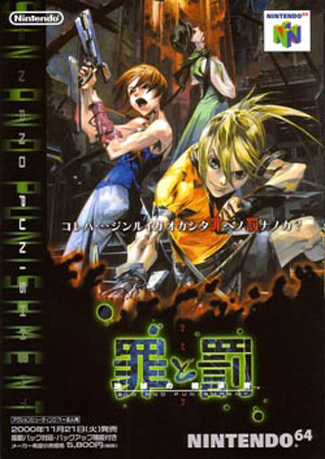 the plot is decent, but the battles are mostly too easy, so it relies on jumping rope etc to keep me playing. im soo stuck of how to get a hammer so ive been stuck on the game for ages the hammerhead people say ive got to get to the top of the mountain so i can get a hammer but to get to the top of the mountain it says i need a hammer! !